Yusei Kikuchi’s introductory presser was a hit in Seattle this afternoon, as the lefty kicked off his address in English and expressed his great delight in becoming the latest to revel in the Japanese-rich heritage of the Mariners, who’ve featured at least one player from the country in every season since 1998. The 27-year-old hurler – or, perhaps to a greater degree, his agent Scott Boras, acting on his behalf – seemed lured to the Pacific Northwest by the promise of a seminal pitching plan developed by GM Jerry Dipoto and staff, one crafted with the express purpose of easing the rigorous transition from Japan’s Pacific League to MLB. “He’s pitched 160-180 innings over the last couple years in Japan, so we’re not going to get super conservative,” Dipoto said (link to article from MLB.com’s Greg Johns). “But we do feel over the course of 30-32 starts of a season, if every sixth start we … make that more of a bullpen day where he … stays on turn and prepares as a normal start, and then goes out and throws a one inning or 30-pitch start, it gives him a nice little breather without breaking turn or taking him away from his routine.” Such a plan would be without precedent in the majors, though with so many Japanese hurlers hitting the shelf soon after their major-league transition, it seems a savvy one indeed. Here’s more reaction and follow-up from the deal . . . The Blue Jays were a surprise entry in the sweepstakes, with Fancred’s Jon Heyman tweeting that the team made a “strong play” for the lefty. The top of Toronto’s rotation crumbled last season, as both Aaron Sanchez and Marcus Stroman struggled to prevent runs, and the back half offered little in way of compensation. The Blue Jays have reportedly made it known that Stroman – who still posted excellent ground-ball (62%) and home-run (0.79 HR/9) rates last season – is available in trade talks, though recent reports have hinted that the club is more likely to keep him. Beyond that, prospects are grim: the club boasts no track records on which it can count, and upper-minors depth is scarce. Toronto does seem high on Trent Thornton, acquired from Houston in a November deal that sent away Aledmys Diaz, but the team will need to concentrate the majority of its efforts on finding quality hurlers in the months to come. Keith Law of ESPN (subscription required) offers his analysis of the deal, writing that Kikuchi has “N0. 2 starter stuff” if healthy, but noting that the lefty’s delivery places undue stress on his shoulder, which has already endured a litany of setbacks in his young career. Shoulder troubles, of course, are notoriously difficult to overcome, and often leave the hurler unable to replicate earlier-career levels of success, so Seattle will certainly need to keep close watch on their new investment in his initial MLB foray. Per Dipoto, via The Athletic’s Corey Brock on Twitter, the Mariners would still like to acquire relievers, “most likely” of the free-agent variety, and are looking to acquire a veteran infielder capable of handling shortstop. The club, of course, has been heavily rumored to be shopping recent acquisition Edwin Encarnacion, and is reportedly still looking to find a way to move both Kyle Seager and Mike Leake. The roster, under Dipoto’s watch, has been in near-constant flux, so it’s safe to assume the Mariners aren’t close to wrapping up their offseason wish list. 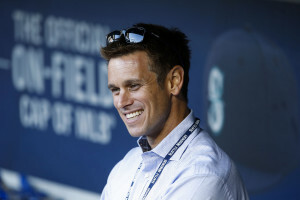 The Mariners announced today that they have agreed to a new, multi-year contract extension with general manager Jerry Dipoto. The former MLB reliever had been in the final season of the deal that he originally inked to run the baseball operations for the Seattle organization. Terms of the new pact were not publicly released by the team. It’s not clear, then, just how long into the future Dipoto will remain under contract. But the announcement did make clear that it’s for multiple years, so presumably he has at least signed on through the 2020 campaign. Dipoto, previously the GM of the Angels and interim GM of the Diamondbacks, took the helm in Seattle before the 2016 season. Jack Zduriencik held the post prior to Dipoto’s arrival. As the club notes in its announcement, the Mariners have MLB’s eighth-best record (220-192) since Dipoto came on board. While the M’s have yet to reach the postseason — a dry spell that dates back to 2001 — they finally seem primed to do so this year. Indeed, the club is surprisingly keeping pace with the defending World Series champion Astros in the AL West, though it’d remain quite a surprise if Houston doesn’t find some separation by season’s end. Though the Mariners still have some work to do to capture a Wild Card, they entered play today with a 7.5-game lead over the Athletics. Dipoto says the ultimate goal remains a World Series. Though that has yet to be achieved, the club obviously determined that Dipoto remains the best option to deliver the hoped-for result. “Jerry arrived here two-and-a-half years ago with a specific plan for our franchise. He has successfully executed that plan, resulting in a younger, more athletic and, most importantly, far more successful Major League team. The youth and athleticism to which Mather refers are certainly themes that Dipoto has emphasized. In that pursuit, Dipoto has earned a reputation as the game’s most active GM on the trade market. We’ve tried to keep up with his prolific swapping in our Transaction Tracker, which reflects a bevy of deals (some significant, some not) since he joined the organization. While critics have argued that those deals, in the aggregate, have not greatly increased the talent base in Seattle, the M’s feel they’ve boosted their overall quality while increasing flexibility and control. Certainly, Dipoto has not shied away from unique swaps in search of value. Among his most interesting swaps are the acquisition of Jean Segura and Mitch Haniger; the two–step swap that netted the club Drew Smyly; the takeover of the contract of Mike Leake; the position-changing addition of Dee Gordon; and, most recently, the early-season strike for Denard Span and Alex Colome.